I decided I needed some color charts. I have been winging it with the color mixing and end up with some pretty dull paintings. 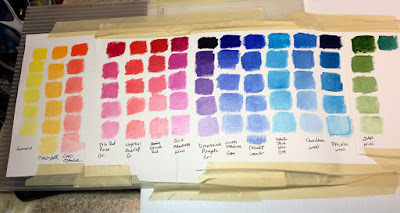 I decided to take some of the many colors I have purchased and have put them all by themselves full strength on the top of a piece of canvas, then added white to make 5 value steps. In the past I have mixed each color with another color and have hundreds of charts that I never use. Here is a chart I will hang on my studio wall and use daily. I wish I had done this when I first started. Maybe I would have saved some money on paint.